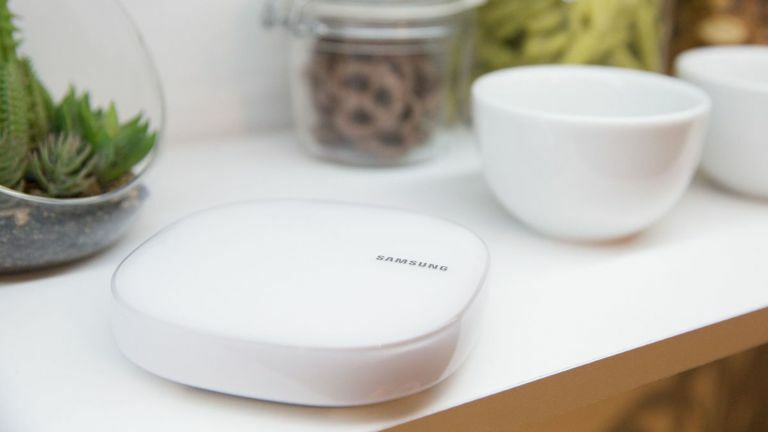 Samsung has shown off its new Connect Home Wi-Fi setup that promises to make any home covered by a better Wi-Fi signal thanks to its mesh network. It also has a built-in SmartThings Hub functionality so you can control all your smart home devices from one place, even if they’re bluetooth rather than Wi-Fi connected. The Samsung Smart Connect Home comes as a single mesh router or in a pack of three. The idea is to place them where signal gets weaker so it can be boosted to cover more of the house. This is ideal for houses spread over many floors or for those with thick old walls. It’s also a nice option for those that want to push the signal further back into the garden. On top of that the built in SmartThings Hub functionality means all smart home gadgets can be controlled via the dedicated app, called Samsung Connect. This allows gadgets to connect via Bluetooth 4.1, Wi-Fi, Zigbee or Z-Wave and all be controlled from anywhere via a network connection of a smartphone with the app. It’s essentially Samsung’s answer to Apple’s HomeKit. There are two model options. The Standard Connect Home features a 2x2 MU-MIMO antenna array with 710MHz quad-core processor and 5GHz spectrum while the Pro version offers a 4x4 antenna with 1.7GHz dual-core processor and quad-band 802.11ac connectivity. The Pro unit can manage to cover 1,500 square feet says Samsung. Pricing and release date have yet to be announced but expect it to be very similar to Google Wi-Fi which also offers similar specs. Google Wifi: what is it and when is it coming out?